The ancient jungles of Borneo are home to five species of rare wild cats. In fact, the cats living in Borneo are some of the rarest wild cats of Asia. Over the last few years, I attempted to see all five of Borneo’s wild cats. I have made three trips to the island and after countless long nights of searching, I found four out of five. Despite the alarming rate of deforestation, the Malaysian state of Sabah in Borneo still retains a large percentage of its original forest cover. The state is home to a network of National Parks, Protected Areas and Forest Reserves. 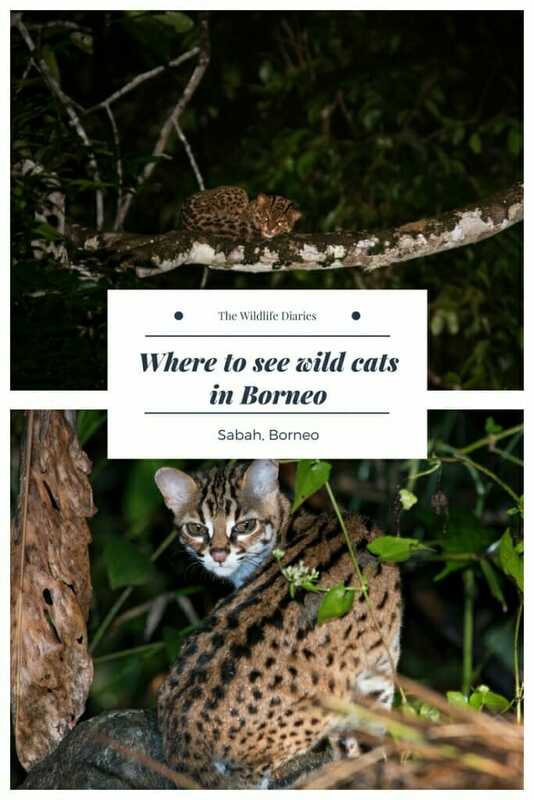 It is by far, the best area in Borneo for spotting wildlife, including the cats. 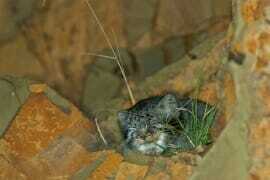 The holy grail of the wild cat world, the Borneo Bay cat is almost never seen. It is found only on the island of Borneo and apart from a handful of sightings, all records of Bay cat come from camera traps. In 2013 a camera trap survey in Kalabakan Forest Reserve found an unusually high density of Bay cats. Although it appears that it was the specific camera placement that increased the rate of detection of Bay cats. In this study, the cameras were placed in the forest, as opposed to the usual placement along the trails and roads. 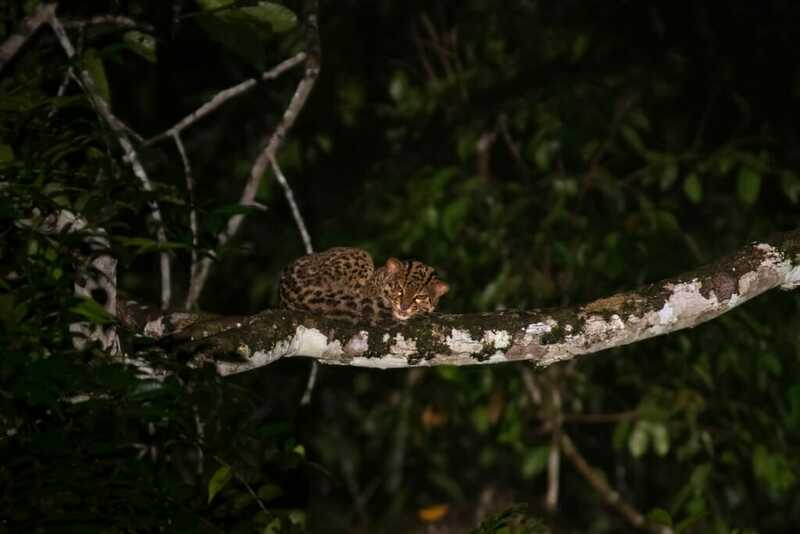 The high rate of detection of Bay cats inside the forest implies their preference for travelling cross-country and avoiding the forest trails, perhaps due to competition with the Clouded leopards. So as of right now, mid-2018 there are no reliable places to even try looking for the Bay cat. But these things change, as they did with Sunda Clouded leopard (more about this below), and a new hotspot can be found some time in the future. The incredible image above was taken by a remotely triggered camera by the ILCP’s photographer Sebastian Kennerknecht in Tawau Hills National Park in Sabah. Another highly elusive feline, the Clouded leopard is rarely seen throughout its range. It wasn’t until 2006 that the Sunda Clouded leopard (occurring on the islands of Borneo and Sumatra) was designated a separate species from the mainland Clouded leopard. And while the split was done on the basis of the genetic analysis, there are some morphological differences between the two species. The Sunda Clouded leopards tend to be smaller and darker than their mainland cousins. In the past, the Sunda Clouded leopard was as rarely seen as the mainland species. 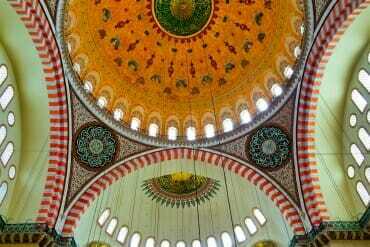 But this changed when a few years ago, a Borneo travel company – Adventure Alternative Borneo started arranging trips to Deramakot Forest Reserve on the upper Kinabatangan river. Deramakot is managed partially for logging and partially for conservation. And it is the presence of logging roads that seems to have done the trick to increase the sightings of the Clouded leopards in the reserve. Like most cats, male Clouded leopards patrol their large territories every night. And it is much easier for them to walk along the open roads than through the thick jungle. And this is where the cats meet the wildlife watchers. Although even in Deramakot, finding a Clouded leopard is no mean feat. I visited Deramakot twice – in February and then in September 2018 and stayed in the park for at least one week each time. The February trip failed to turn up a Clouded leopard, but in September I was lucky to spot a young female leopard crossing the road in broad daylight. The sighting was brief. Too brief to even take a photo and my only proof of the encounter is this image of the footprint she left in the wet mud. While not endemic to Borneo, the Marbled cat is rare across its entire range that stretches from the Himalayan foothills to Malaysia, and to the islands of Sumatra and Borneo. It is similar in appearance to the Clouded leopard but much smaller. And like the Clouded leopard, it has a very flexible ankle joint that allows the cat to descend from trees head-first. Marble cats are very rarely seen in the wild and just like the with the Clouded leopard, most sightings come from Deramakot Forest Reserve. I have seen Marbled cats on both trips to Deramakot. On the first trip, we spotted the cat snoozing on a tree branch about 40 meters above the forest floor. We watched it for about 30 minutes until it got up and climbed down the tree. Interestingly, it climbed down in the conventional – ’tail first’ manner, rather than going head-first, as we hoped it would. 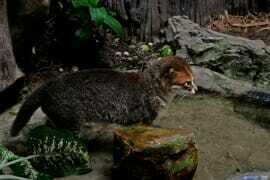 On the second trip, we got word that a Marbled cat has been sighted in a certain location. While we were driving to the spot, we got caught in a torrential downpour, but we found the cat in the same spot, once the rain stopped. It was happy to snooze on a high branch and didn’t mind our presence below. After about 30 minutes, just as we were ready to leave we spotted the second cat a bit higher up the tree! The second cat wasn’t as happy about being discovered and shortly disappeared into the thicker part of the canopy. We assumed it was the parent of the younger and the more tolerant cat below. 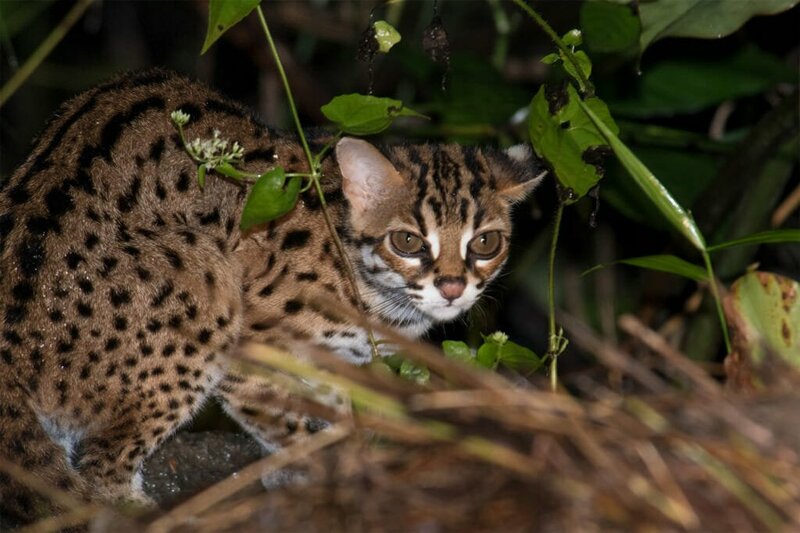 One of the least known wild cats in the word, the Flat-headed cat also has the unfortunate distinction of being Asia’s most endangered small cat. The reason for the cat’s demise is its preference for the lowland riverine forest habitat. Unlike most cats, the Flat-headed cat spends most of its life in or near water, hunting fish and small crustaceans with the help of its partially webbed feet. Unfortunately, the riverbank habitat is the prime real estate in Asia. Houses, lodges and plantations have replaced much of the cat’s habitat. At least 60 percent of the habitat is already gone and more is disappearing at an alarming rate, mainly being taken up by the oil palm plantations. The floodplains of the lower Kinabatangan River remain the final stronghold of the species. Although even here, they are rarely seen, as I learned after searching the riverbanks for five nights in 2015 and only spotting a single Flat-headed cat in a very brief encounter. 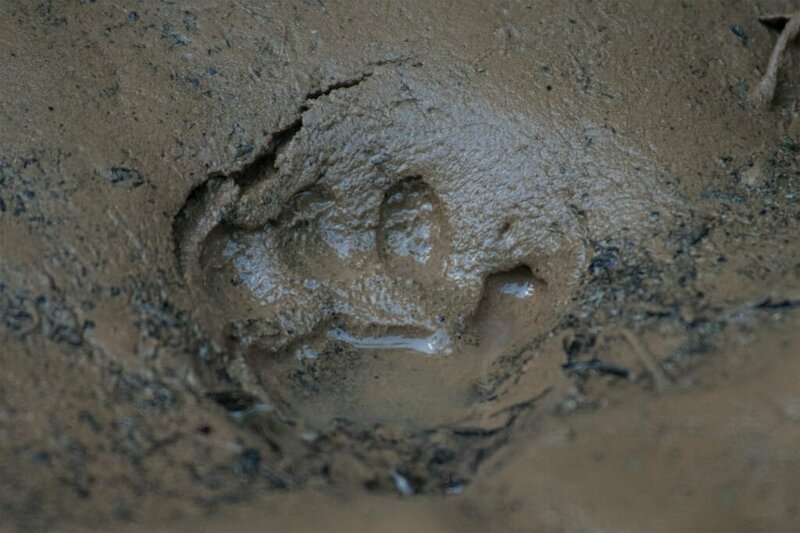 I returned to the river for two nights in February 2017, but after the recent rains, the water level was too high, which made for poor cat spotting conditions. When the river bursts from its banks and floods the surrounding forests, the cats move to the smaller tributaries which are not accessible by boat. In October 2017, two fellow mammal watchers who spent a week with us in Deramakot visited Kinabatangan and had a good sighting of the Flat-headed cat. The Leopard cat is the most common, or rather the least uncommon wild cat in Asia. 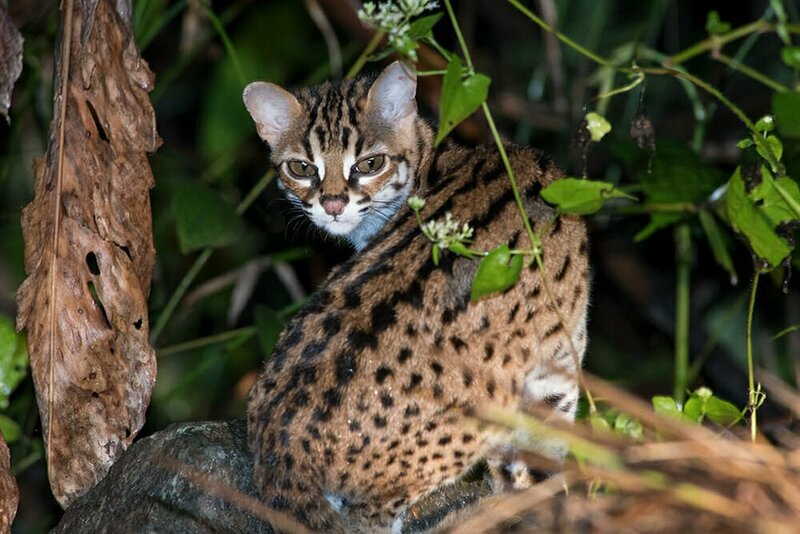 In 2017 the IUCN recognized the leopard cats living on the islands of Borneo and Sumatra as a separate species from the mainland leopard cats. So now we have the Sunda Leopard cat and the Mainland Leopard cat. Sunda Leopard cats can be seen in most forested areas in Borneo, even in the oil palm plantations. I have seen them in Danum Valley, Kinabatangan River and Deramakot Forest Reserve. They are attractive little hunters and fun to watch as they hunt some unseen prey in the grass or simply strut down the road. You can find information about visiting each of these areas in this post about Best Places to see Wildlife in Borneo.